If you have been at this web site very long, you know I like miller welding equipment. But I try keep an open mind... I have known for a long time that no one can compete with Lincoln on the small 115v mig welding machines. A reader submitted a question recently that read: Between a Lincoln Electric, and Miller, which would be a better brand for a small MIG welder? Miller does not even sell 115v mig welders in the big box stores like Home Depot, Lowes, Northern Too or Tractor Supply. Since ITW and Hobart are both owned by ITW, Hobart is the brand sold to the hobbyist market. Lincoln 115 volt mig welders are available at Home Depot and other big retail outlets but what you need to know is that Lincoln offers many different variations of a 115 volt mig welder. They have several 140 amp wire feeder welders referred to as the "retail wire feeders". with model names like "weld pak, pro mig, easy mig". 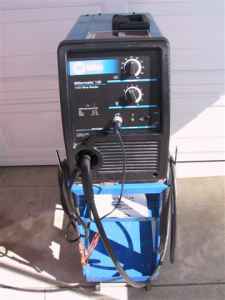 Then there are the power mig 140 amp welders with a somewhat higher price tag that seem to be sturdier machines than the retail models. So what I am saying is to do your homework before buying. Visit websites like Northerntool.com and read the reviews and pay close attention to model names and numbers. 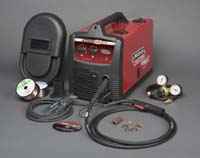 I really dont think you can go wrong with a small Lincoln Mig welder. Here are the areas where lincoln beats miller in construction of the machine and features. •The wire drive system is cast in a single aluminum block for robust wire feeding. •Large wire feeder motor provides plenty of torque for recommended wire sizes and industrial closed design is much more resistant to grinding dust than cheaper retail type units. • Power MIG models ship with more contact tips, more nozzles, more MIG and flux-cored drive rolls, and a spool each of bare wire MIG and flux-cored wire.